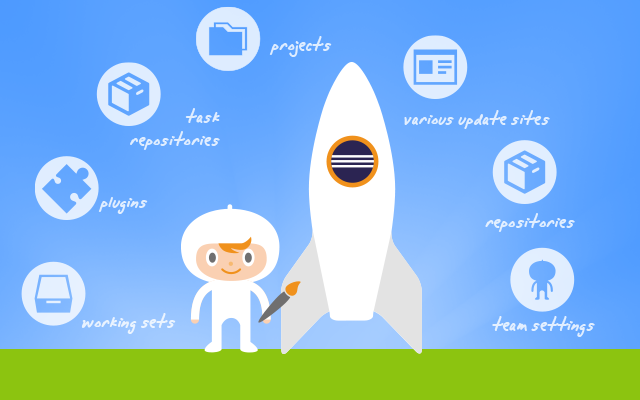 The Launcher is a lightweight desktop app and the easiest way to organize your Eclipse setups – for yourself, your team, or within the community. Save your project setup as a profile, share it with your team and just start building great software. Try it now - it's free! A profile is a "snapshot" of an Eclipse workspace combination containing plug-ins, workspace settings for your team (e.g. project metadata and -preferences, build server configurations and working sets), and links to source code and task repositories (like on GitHub). No actual source code of course. The Yatta Launcher lets you build a profile form any Eclipse setup – automatically. You can even share your profiles with other users and, if you like, with the community. And it's for free! Start any Eclipse setup from a central location. Make your setups distinct with a name, an icon and a description. Help new team members get productive. Distribute your new project setup faster. Stop sending zip files with Eclipse setups. Create and distribute your profiles for different project teams or for specific tasks or requirements. Automatically inform teams about profile updates. Build chains of parent, child, and grandchild profiles to manage project setups within your company and across your teams. Install your profile on another operating system. Install your Eclipse IDE and workspace configuration on another device - and even on another operating system. Start any profile directly from the Yatta Launcher, or create your own desktop shortcuts. Make your profile unique: Customize name, description, color, and icon. The Client – Eclipse plug-in that lets you share and update your running Eclipse (profile) directly from within your IDE. The Launcher – Lightweight desktop app to help you manage all your Eclipse installations: Install, start, update, share or uninstall any profile via the Launcher. The Profiles Hub – The Profiles Hub is the central Hub for downloading Eclipse profiles. When you share a profile, it will be available on the Profiles Hub. If you are searching for a profile that meets the requirements of your project - for example a certain set of plug-ins - the Profiles Hub is the place to visit. Use the search and filter functions to find what you are looking for. From the Profiles Hub, you can access any profile that's publicly available. Yatta Profiles was designed to make starting new projects with Eclipse really simple. The best thing: Yatta Profiles for Eclipse is completey free - so go ahead and try it! Start a specific Eclipse setup. Create, describe and distribute you profiles for project teams, specific tasks or requirements. Automatically inform profile followers about profile updates. Build profile Chains and manage Eclipse setups within your enterprise and across your teams. Visit our website for more information and free download. Note that Profiles is still beta but stable – and productive. Anyhow, don't hesitate to send us feedback or file an error report in case anything doesn't work as intended. We are working hard to continuously improve Profiles as well as other parts of the Eclipse IDE. Stay tuned for our roadmap. There is a lot more to come. You have a feature request? Send us an email! Do you need more information? Contact us and follow the latest Yatta News on Twitter, Facebook or Google +. By adding the following code below to your website you will be able to add an install button for Yatta Launcher for Eclipse. It's required that at least a .project file or a pom.xml is checked in. An internal error occurred during: "Waiting for Launcher". I am behind a proxy so I was wondering if this is causing it? You can download the Profiles for Eclipse Launcher via https://www.yatta.de/profiles/download, also. Eclispse Version: Eclipse Java EE IDE for Web Developers. Yatta Profiles sounds very interesting. For my use-case I need a posssibility to check settings permanently to a default set. Actually I use Workspace Mechanic for this, it has a mode called "Reconcile" that do this. It is needed to force the developer to use specific code formatter, file encoding, line delimiter and so on. To prevent merge conflicts and roll out global quality metrics. Is this also possible with Yatta Profiles?